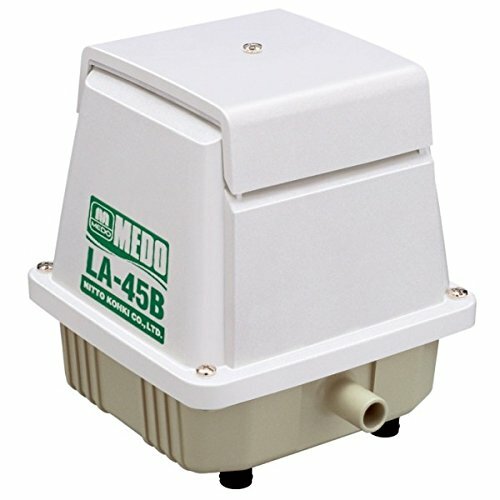 Ideal for liquid mixing(i.e., bubbling) and smaller aquaculture applications, Medo LA-45C is a low noise, energy-efficient, easy-to maintain aerator that needs no lubrication SPECIFICATIONS Model LA-45C Power Supply AC 120V. Rated Frequency 60Hz. Operating Pressure Range 0.71 - 2.13 psig. Rated Pressure 0.11kgf/cm2(1.56 psig). Rated Airflow* 45 LPM (1.59 cfm) or over. Power Consumption 45 W @ 60 Hz. Running Current 1.0 amps. Operating Noise 38 dB Max. Weight 3.0 kg. Highly reliable, unique, die cast piston construction. UL-approved for outdoor use. Integrated grounded line cord. Service life expectancy of 6 years with proper installation and periodic maintenance. Environmentally conscious design allows the pump to operate with lower energy consumption as it requres only 50-60% of the line currrent typically used by diaphragm pumps. UL-listed for outdoor use Low Noise Level The pumps operate at a very low noise level, about that of a light ballast, as there are no crankshafts, connecting rods or ball bearings to create additional noise. Low power consumption With the piston as the only moving part, frictional losses are diminished which allows for lower starting and running current. Line current requirements are only 50-60% of that typically used by diaphragm pumps. Automatic Pressure Adjustment Designed to self-adjust should the pressure exceed the rated value of the pump, the piston stroke will automatically shorten to reduce the strain on the pump. At the same time, power consumption of the pump will decrease to protect against possible increasing Self-cooling design Air drawn in through the intake valve over the coils reduces the temperature seen in the interior of the pump. 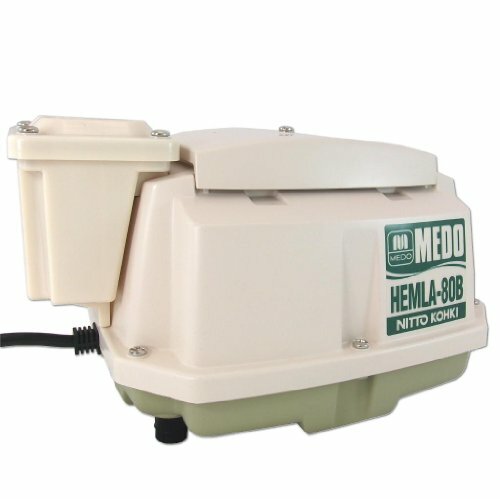 MEDO pumps feature a unique, patent-awarded linear-motor-driven free piston system that is globally proven in the wastewater treatment and aquaculture industries. 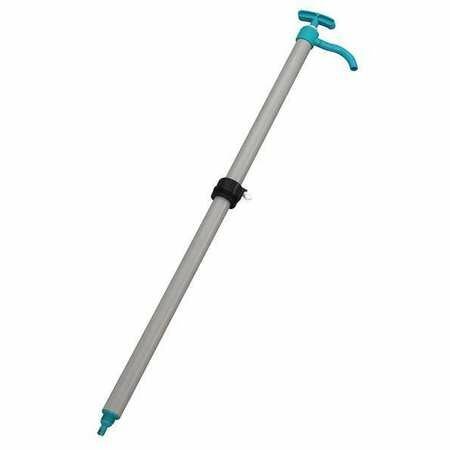 This Action Pump 909 piston drum pump is made of PVC (polyvinyl chloride) for resistance to acids, gasoline, alcohol, and hydrocarbons, delivers a maximum of 8 oz. of fluid per stroke, and is suitable for dispensing detergents, most acids, chlorines, oils, D-limonene, waxes, alkalis, water, or soaps. It has a 1/2" discharge spout and comes with a 36" discharge hose. This piston drum pump is suitable for use with 15, 30, and 55 gallon drums for dispensing liquids in a wide range of industrial and commercial applications. Specifications Pump Piston drum pump Materials PVC pump and components, polyethylene suction and discharge hoses Flow rate 8 oz. per stroke maximum Discharge port 1/2" Maximum temperature 140 degrees F For use with 15, 30, and 55 gallon drums Weight 3 lb. 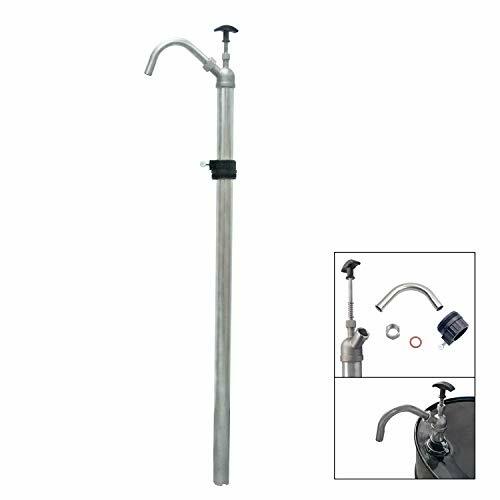 Dimensions Overall length: 41-1/2"; Suction hose: 31-1/2" Discharge hose: 36" Pumps use mechanical action to move liquids, gases, or slurries (solids suspended in a liquid or gas). The mechanical action is categorized as either positive displacement (PD) or kinetic. PD pumps capture and release discrete amounts of flow into a chamber and then force it out. Some examples of PD pumps are fuel and oil pumps in cars, pumps in hydraulic systems, and bicycle pumps. Kinetic pumps move liquids, gases, or slurries by transferring energy from the pump's movement to the flow. They use an impeller to draw the flow in, add energy to the flow, and move it through a volute (a spiral funnel through which the flow moves), and into the system. Some examples of kinetic pumps include centrifugal (the most common pump in industrial applications), in-line pumps, sump pumps, and suction pumps. Energy sources for all types of pumps include wind power, manual operation, electricity, and gasoline or diesel fuel. Action Pump manufactures drum and pail pumps and grease, oil, and lubrication products. The company, founded in 1981, is headquartered in Cary, IL. 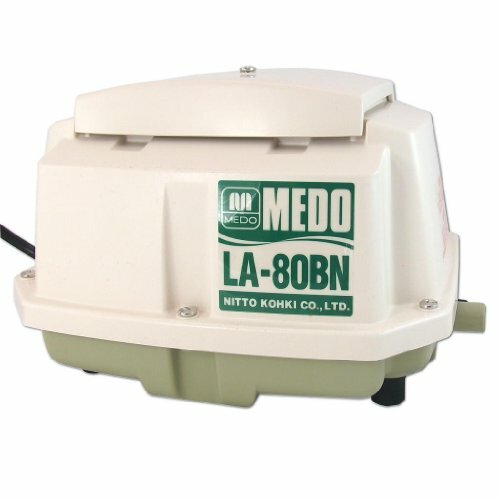 The Medo HEM-LA80B linear piston air pump has the same high performance design with one added benefit. The HEM-LA80B has a built-in alarm which will notify you the air pump pressure drops below the normal functional level. 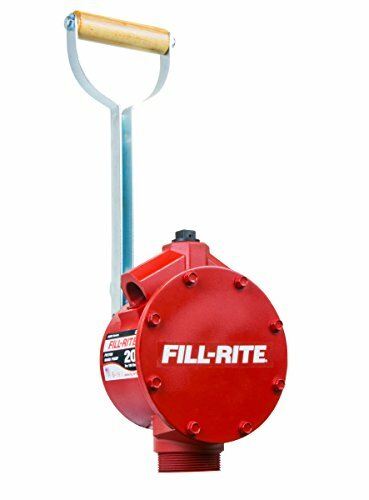 Fill-Rite's 5200 series is a piston hand pump that can be used to transfer gasoline, diesel, light oils, and kerosene. 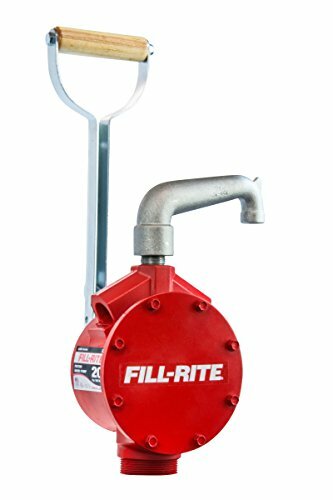 The FR151 model is designed for filling buckets or containers through a spout that connects directly to the pump's outlet. 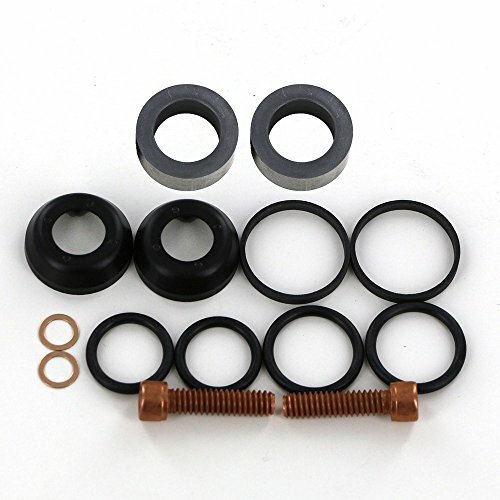 This Hypro 5300 Rubber Cup and Guide Kit (3430-0010) includes replacement parts needed to fully restore problems on your Hypro 5315, 5320, 5325, and 5330 Series Piston Pumps with rubber cups (C-RX and C-HRX versions). The Hypro 3430-0010 Repair Kit works on the following Hypro Piston Pump models: 5315C-RX, 5315C-HRX, 5320C-RX, 5320C-HRX, 5325C-RX, 5325C-HRX, 5330C-RX, and 5330C-HRX. IPM Transfer Pumps IPM's 100 Series 2:1 is designed specifically for difficult to handle materials. The immersed lower pump, tie-tubes, and sealing bung bushing allow quick drum change without exposing the system to contamination and moisture. Higher Viscosities Ease of Cleaning Fluids with 245a Agent Low Ceiling Installations Interchangeable Pump Lengths New design innovations to simplify handling and application of polyurethane, polyurea, and other two component materials. New design for cleanable tubes Allows thorough cleaning of the pump fluid tubes. Both the IP02 and the OP series have easily cleanable fluid tubes. Feature allows for nearly an unlimited number of pump rebuilds. IP and OPC Series Pumps now have high viscosity "B" resin capabilities IPM 2:1 Transfer Pumps "B" resins with the newer 245fa blowing agent can have viscosities up to 2000 cPs. OP and IP series pumps have increased suction capability by 69%. Pumps have the capability of pumping the new "B" resins without heat or pressurization. The new design nearly eliminates foaming of the material. Outlet ports are now a standard " NPT. 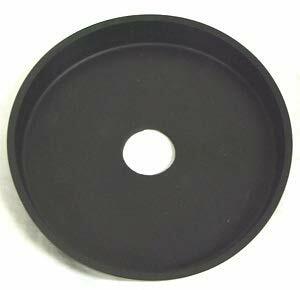 Specially designed piston seals do not come into contact with material pumped. Hence, very long life as it can handle highly problematic fluids like Isocyanates which crystallizes on piston rods upon contact with moisture in air and rupture seals. Ideal for delivering fuel to oil burners as well as to ake out water or oil from drums or other containers. Yellow Jacket 41133 titan manifold piston assembly. 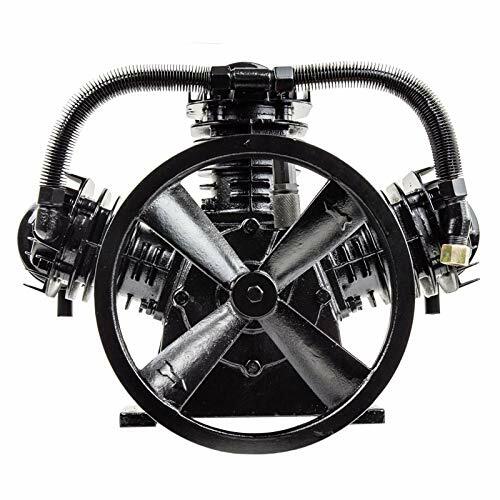 Brand new three cylinder cast iron single stage air compressor pump. This is a 5 - 7.5 horsepower pump that will deliver 16.94 CFM at 900 RPM, with a max RPM of 1000. This pump is most commonly used on compressor tanks of 60 - 80 gallons in size and can be used with 220-volt 5 - 7.5 horsepower electric motors. To verify your motor is large enough, it should be at least 20 amps or higher at 220 volts and 5 - 7.5 HP. 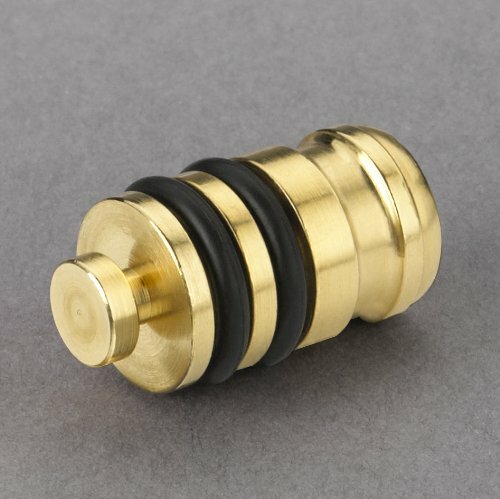 Piston Cup Seals are used in both hydraulic and pneumatic applications on rams or plungers. Homogeneous rubber piston cup seals perform best in low pressure applications under 150 PSI. Fabric reinforced piston cups are used in high pressure applications that allow operating pressures to reach 1000 PSI. Mechanidrive offers double-acting piston cups in a multi-rubber material where the external rubber is bonded to the substrate internal metal disc thus allowing only one part to be required. The double acting piston cup is the most economical and sensible type of piston cup available on the market. It is essentially designed for low pressure hydraulic and pneumatic applications. 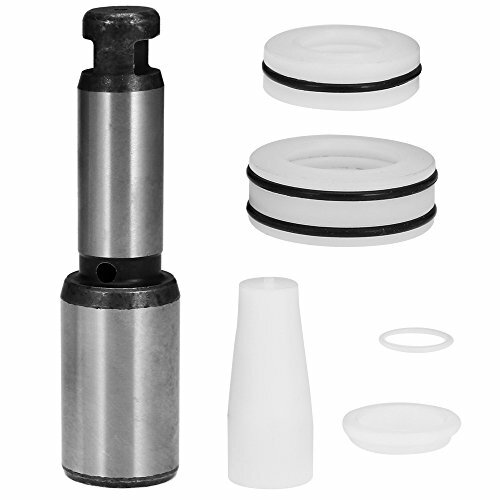 View our complete line of piston cup seals for your hydraulic and pneumatic processes. 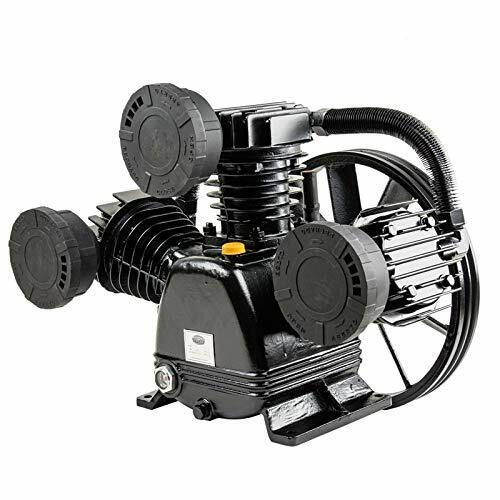 1.5 to 2 HP Replacement Single Stage V-Cylinder Air Compressor Pump Brand new two cylinder cast iron single stage air compressor pump. This is a 1.5 - 2 horsepower pump that will deliver 3.53 CFM at 1000 RPM with a max CFM of 4.5. This pump is most commonly used on compressors under 30 gallons in size and can be used with 110 volts or 220 volts 1.5 to 2 horsepower motor. Using a larger two horsepower motor and spinning around 1200 RPM, you will get a max of 4.5 CFM. This pump comes complete as shown in the photos, including intake filters and flywheel. See specifications below for more details. 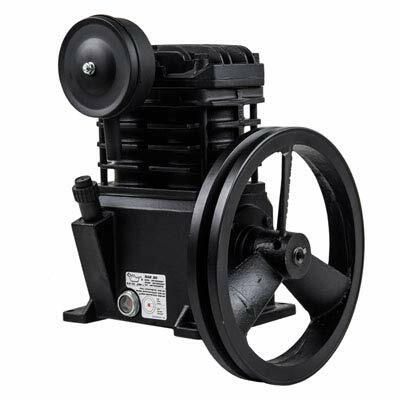 Features: Cast Iron Cylinder and Crankcase Equipped with Sight Glass for Easy Viewing of Oil Level Comes with Two Intake Filters Specifications Two Cylinder Single Stage 1.5-2 HP Recommended Working Pressure: 115 PSI Recommended RPM: 900-1200 CFM: 2.8-4.5 Flywheel Diameter: 10.5"
Brand new two cylinder cast iron single stage air compressor pump. This is a 1.5 - 2 horsepower pump that will deliver 3.53 CFM at 1000 RPM. 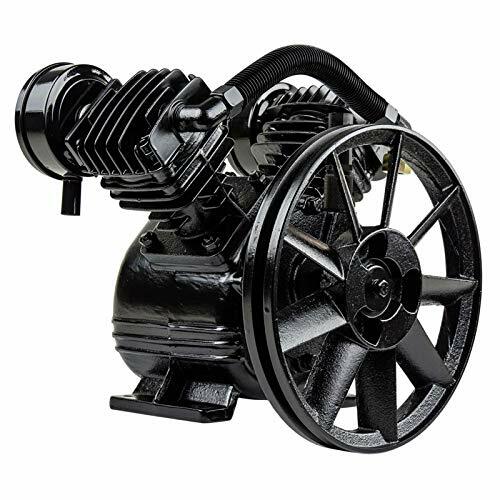 4-5 HP Replacement Single Stage 3 Cylinder Air Compressor Pump Brand new three cylinder cast iron single stage air compressor pump. This is a 4-5 horsepower pump that will deliver up to 10-12 CFM depending on the RPM. This pump is most commonly used on compressor tanks about 60 gallons in size and can be used with 220-volt 4-5 horsepower electric motors. To verify your motor is large enough, it should be around 17-22 amps at 220 volts. All specifications listed on pump-spec plate are ratings at minimum horsepower and RPM. This pump comes complete as shown in the photos, including intake filters and flywheel. See specifications below for more details. Features: Cast Iron Cylinder and Crankcase Equipped with Sight Glass for Easy Viewing of Oil Level Comes with Three Intake Filters Low Oil Consumption Specifications Three Cylinder Single Stage 4-5 HP Cylinder Diameter: 65mm Maximum Recommended Working Pressure: 115 PSI Recommended RPM: 1000-1200 CFM: 10-12 Max Flywheel Diameter: 10.5" Mounting Hole Dimensions Center to Center Front to Back: 5.2" Side to Side: 8.43"
This is a 4-5 horsepower pump that will deliver up to 10 - 12 CFM. This pump is most commonly used on compressor tanks about 60 gallons in size and can be used with 220-volt 4-5 horsepower electric motors. Image representative of product category only. actual product may vary in style. gt code-cylinder piston seal image representative of product category only. actual product may vary in style.